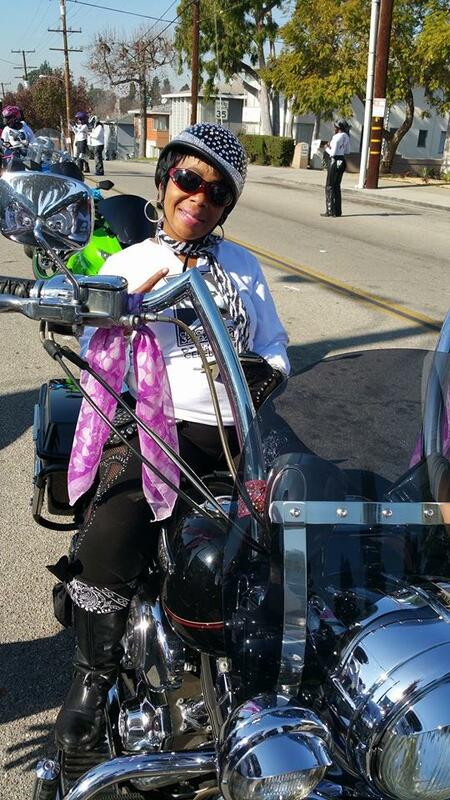 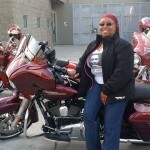 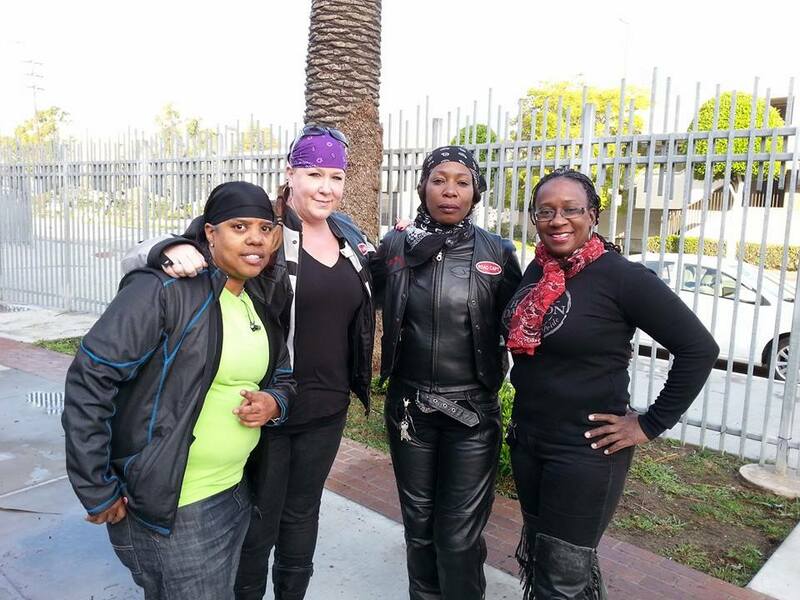 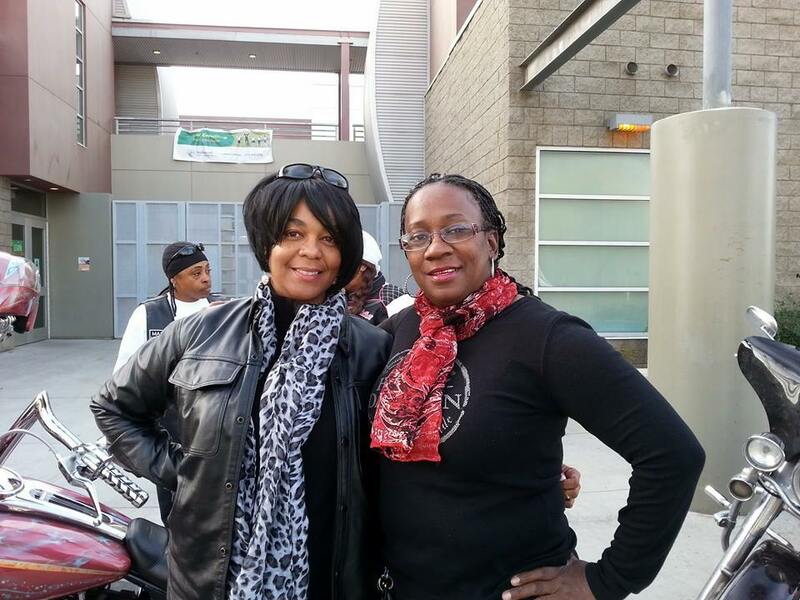 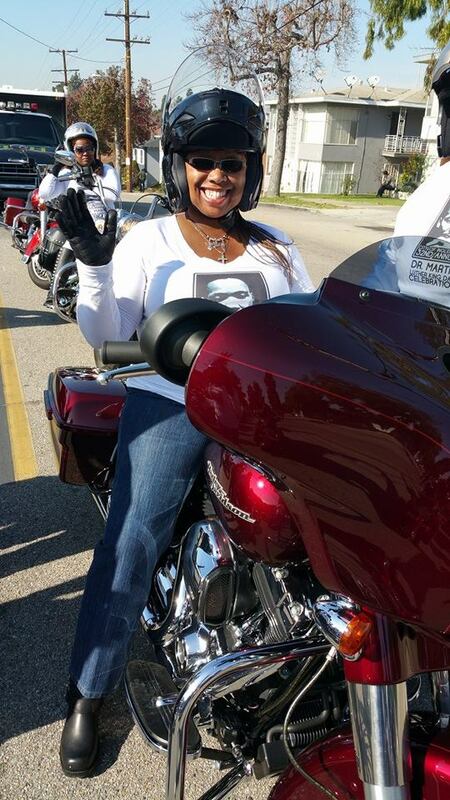 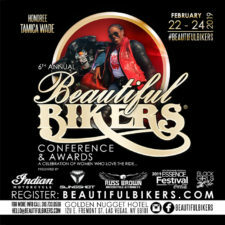 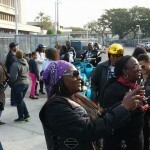 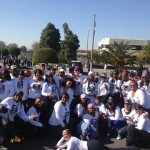 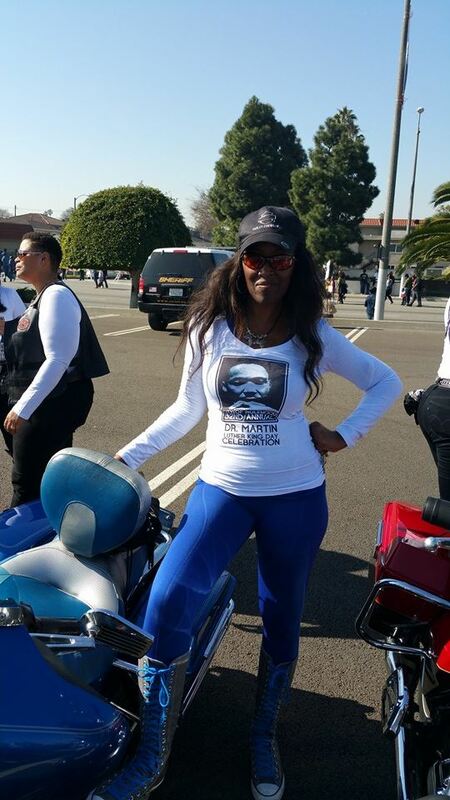 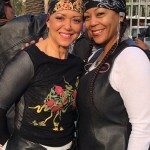 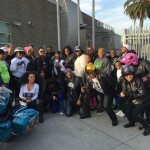 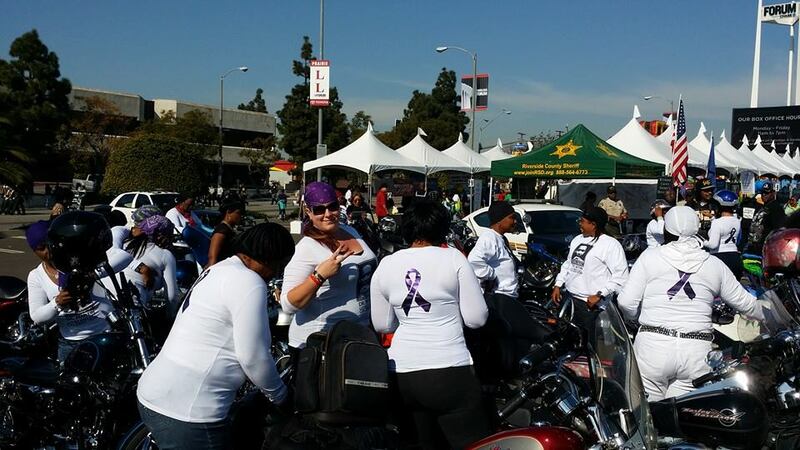 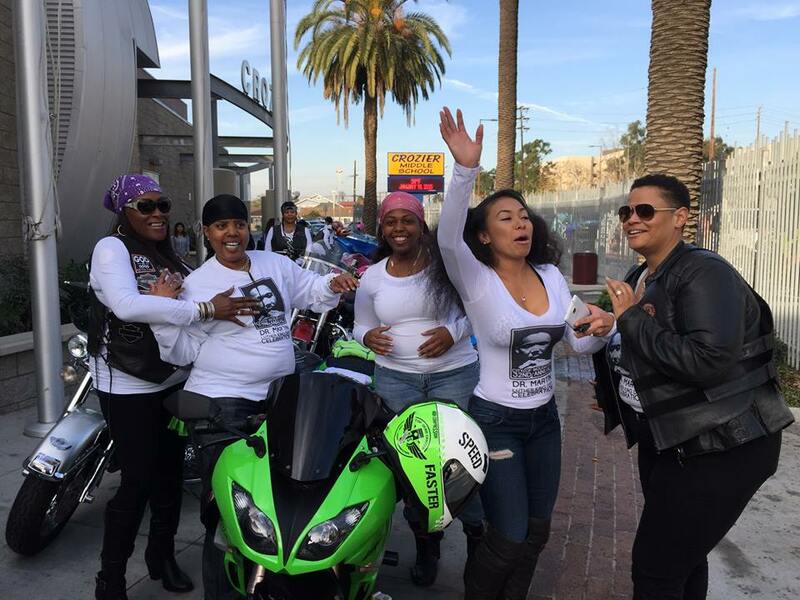 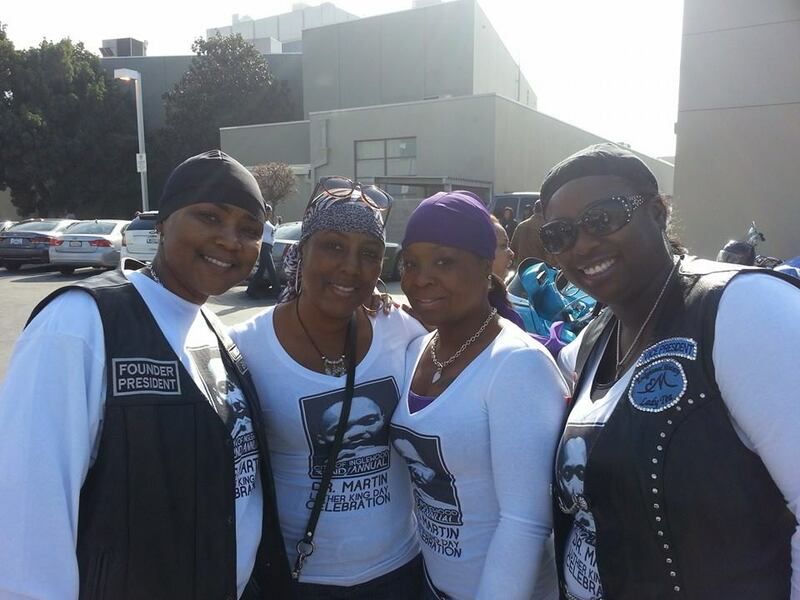 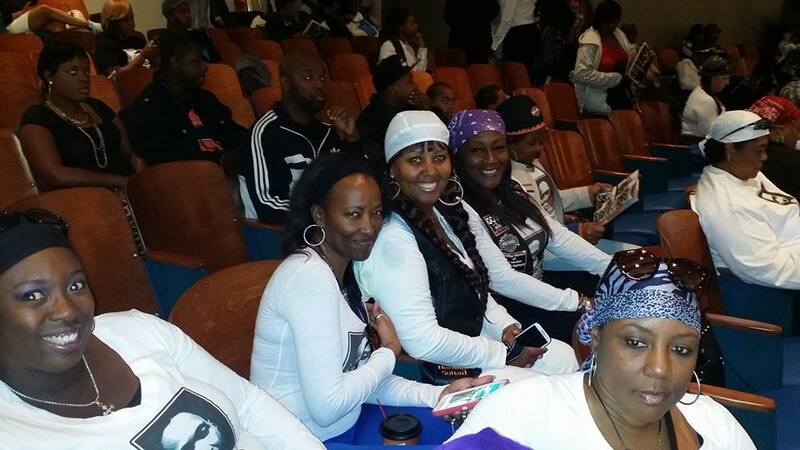 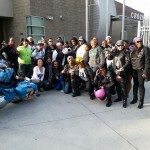 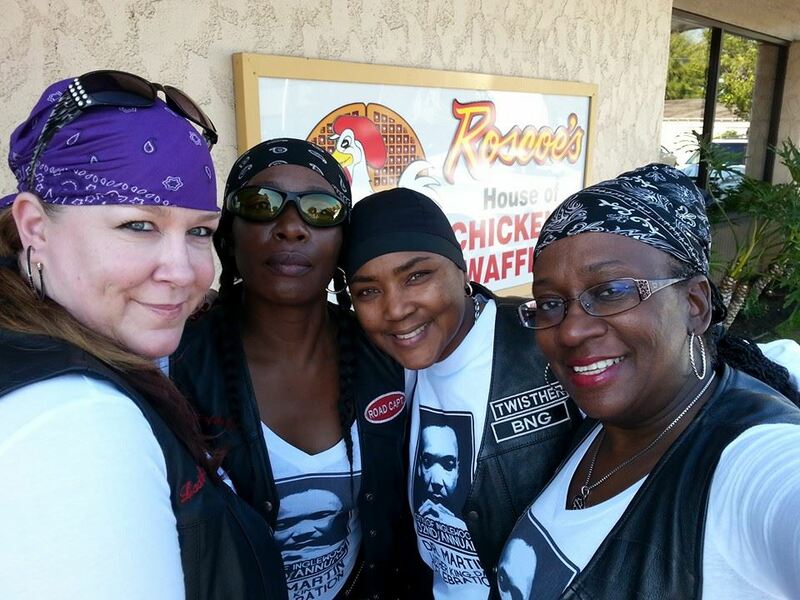 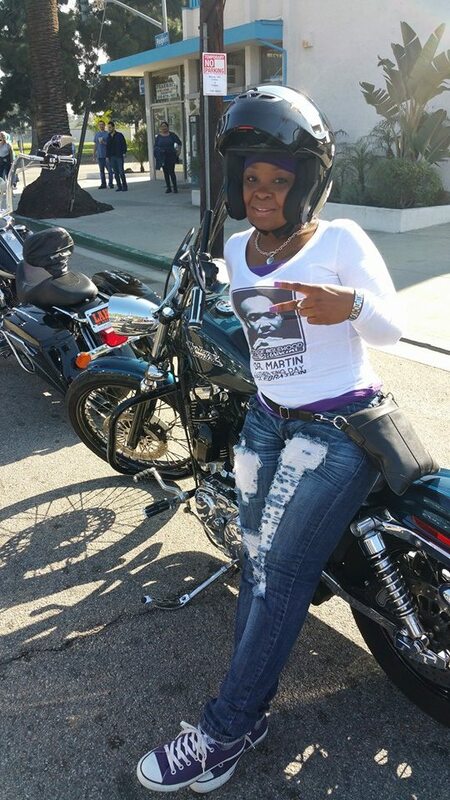 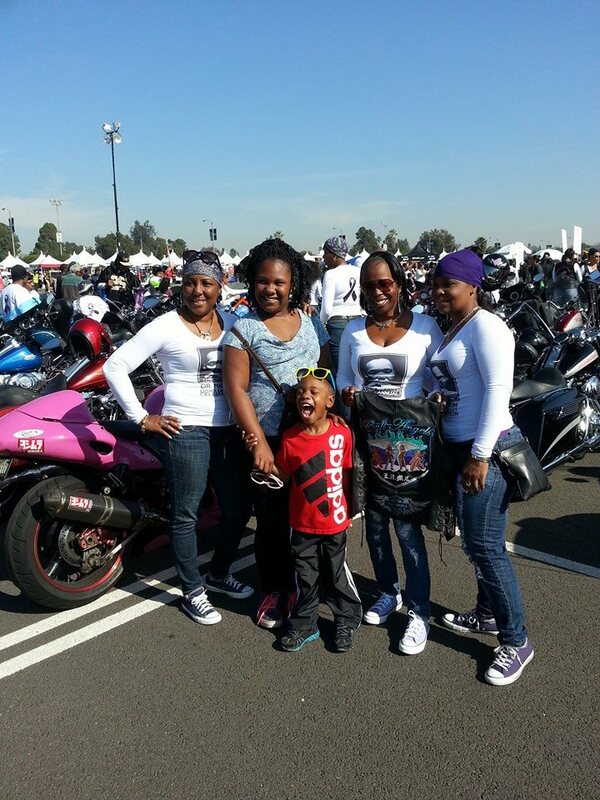 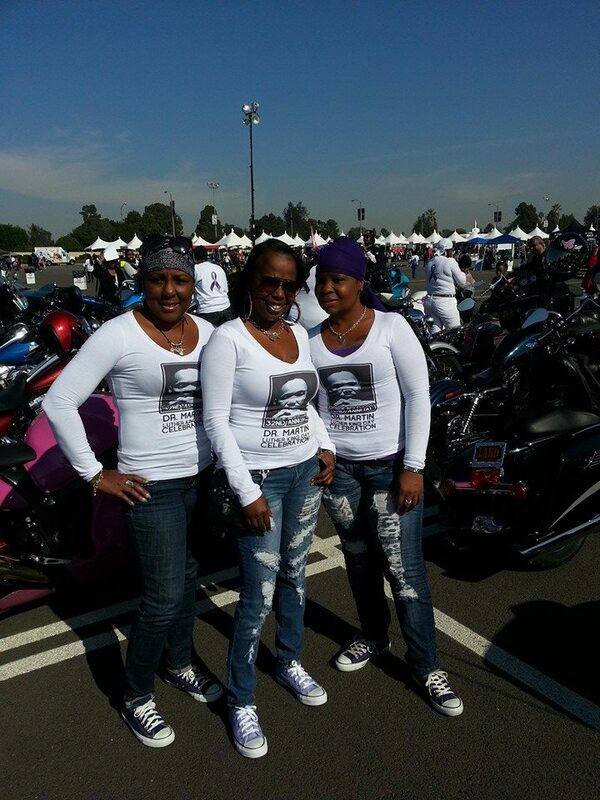 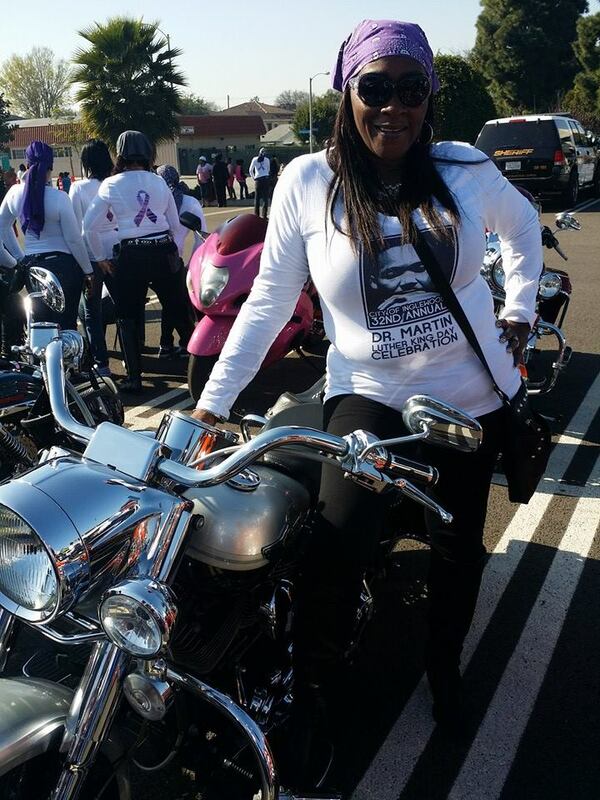 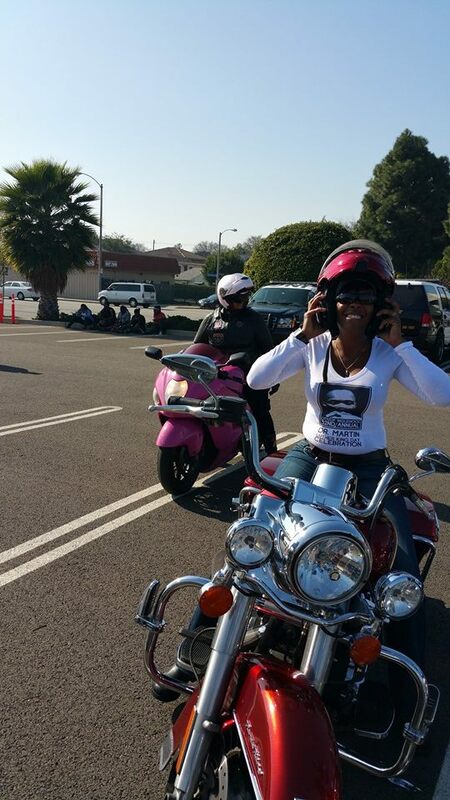 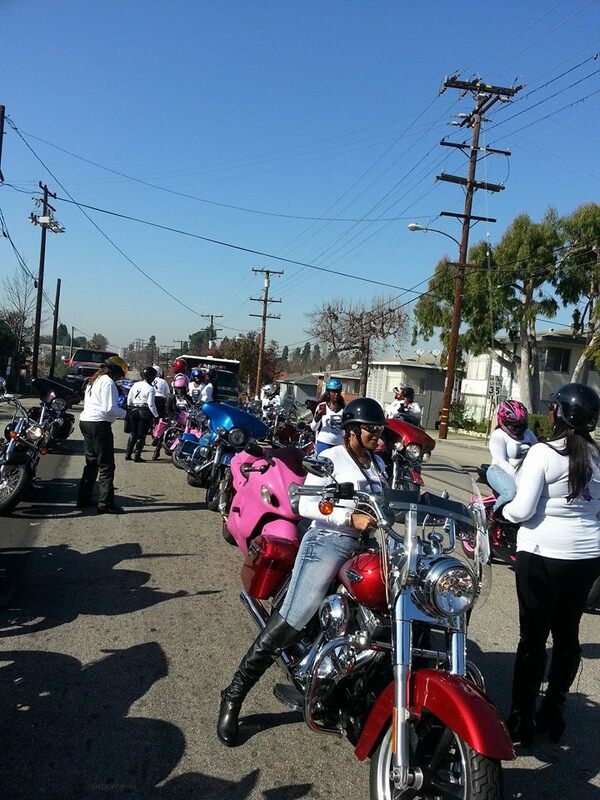 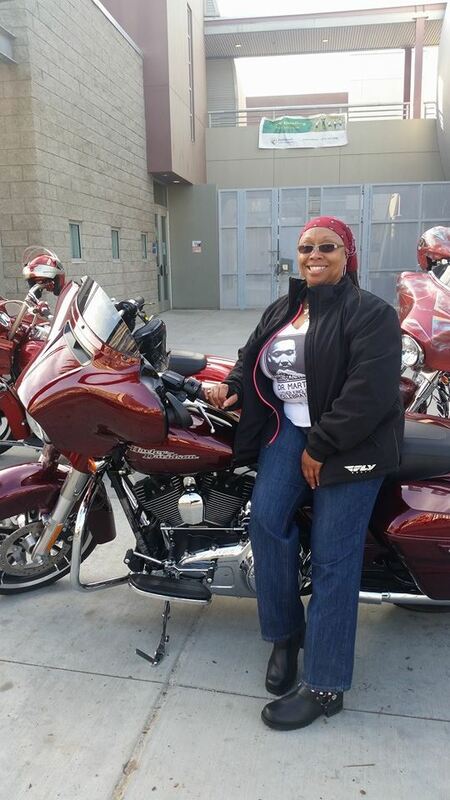 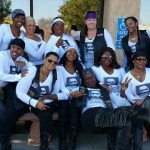 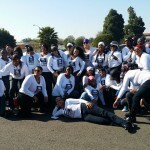 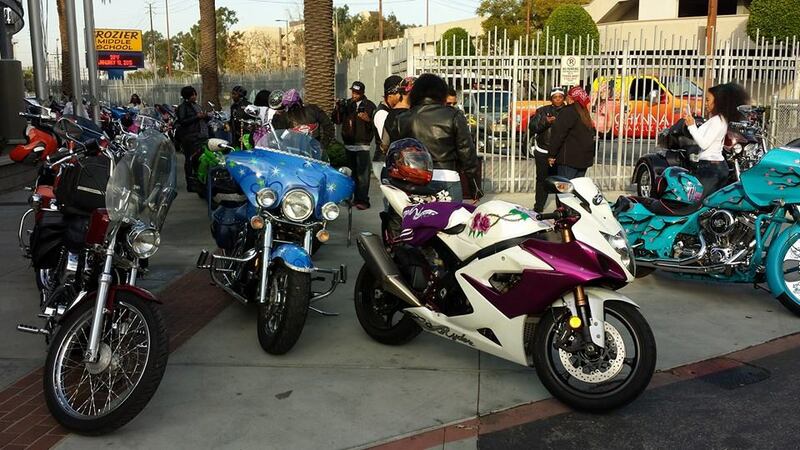 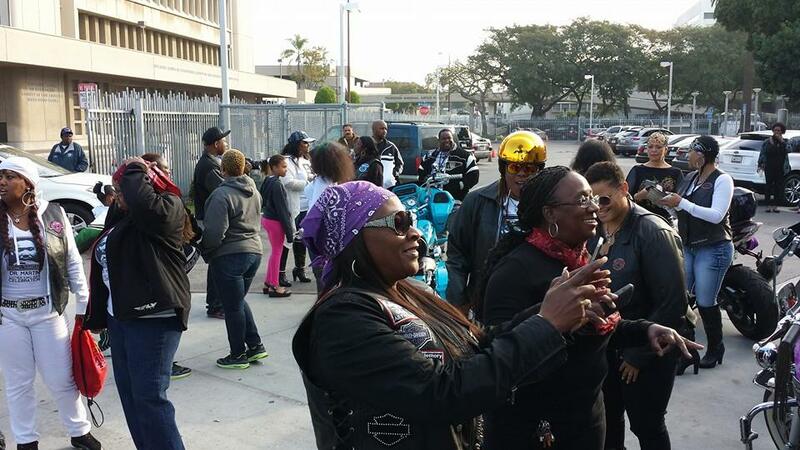 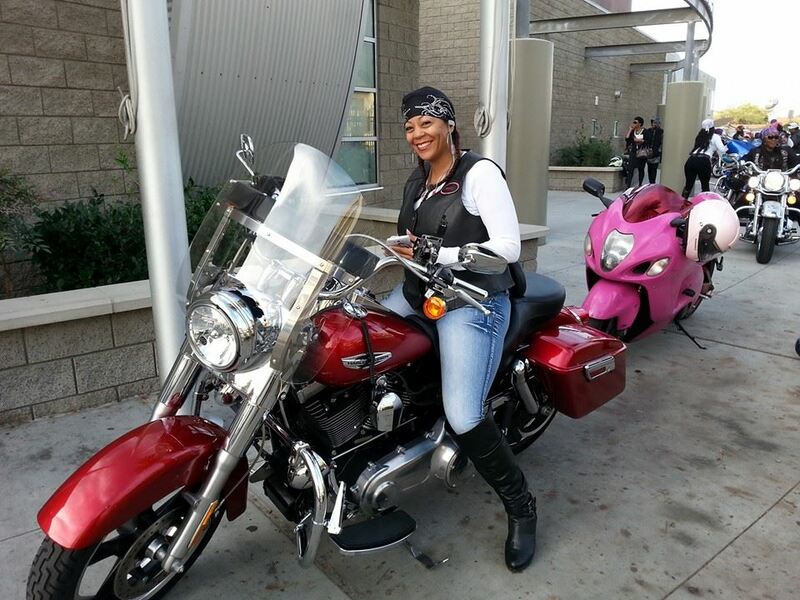 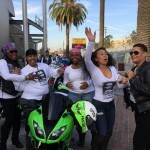 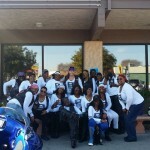 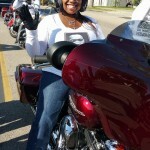 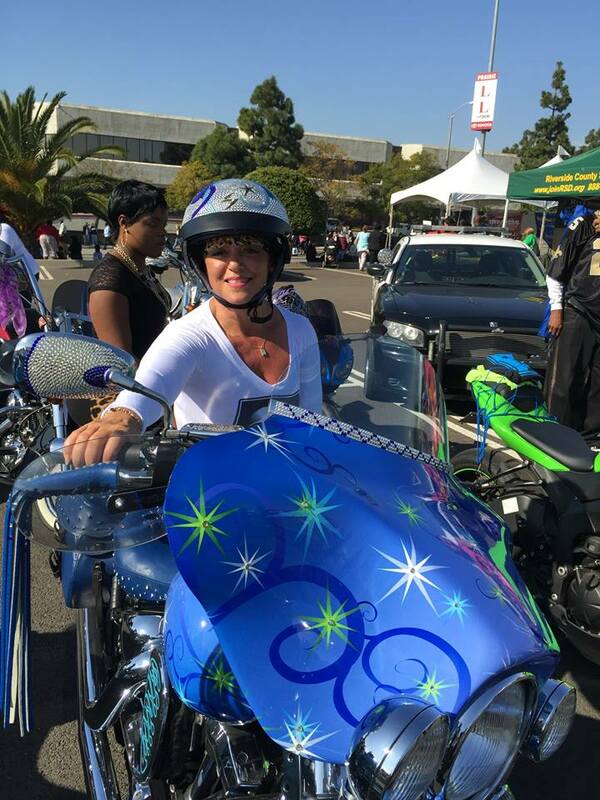 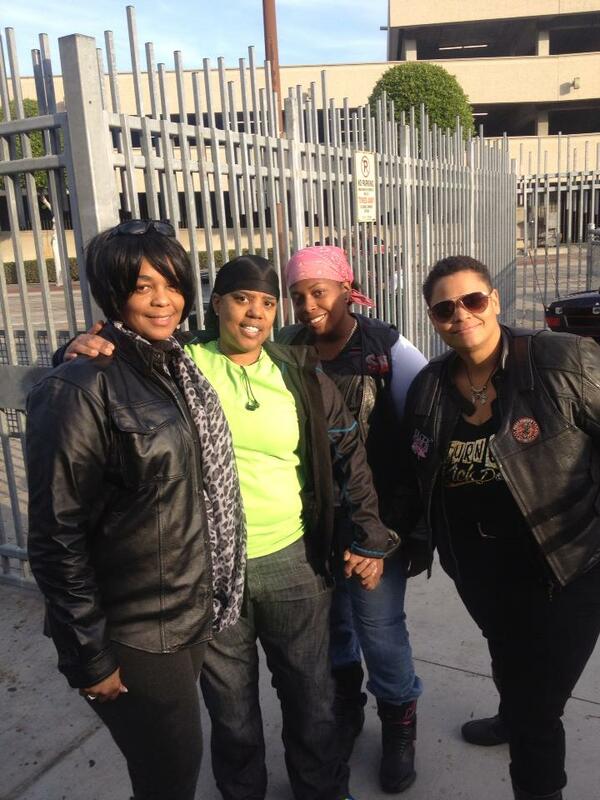 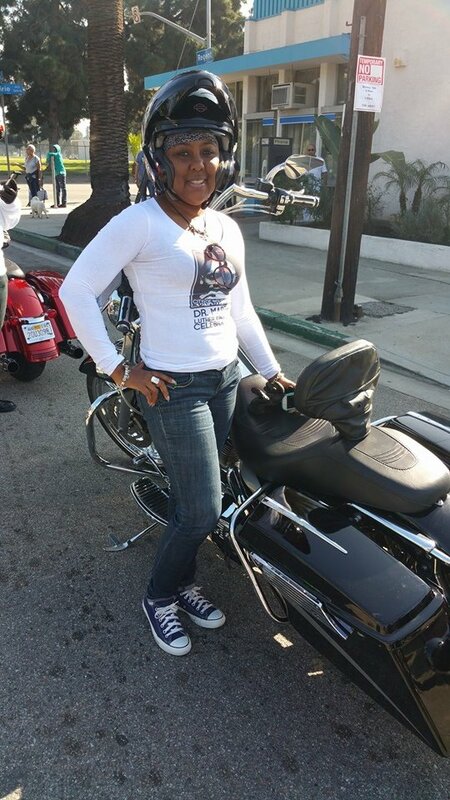 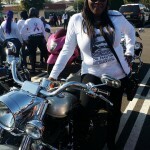 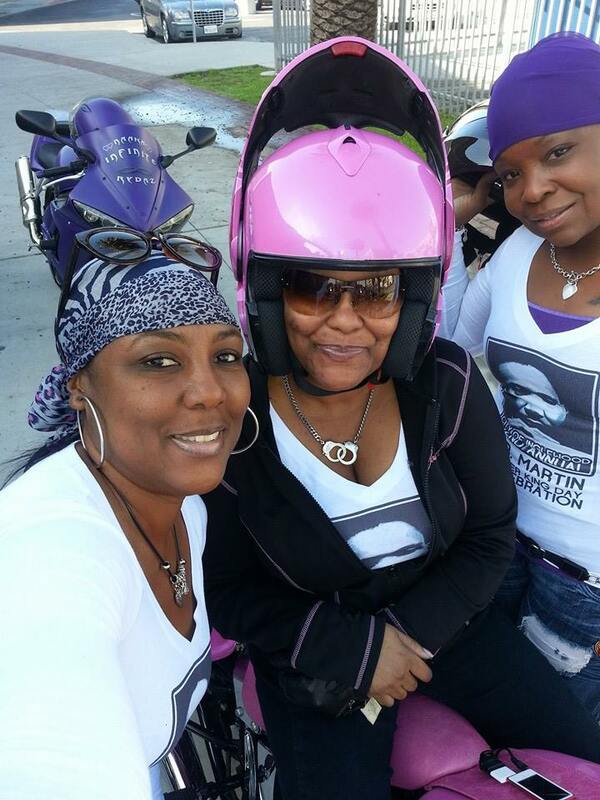 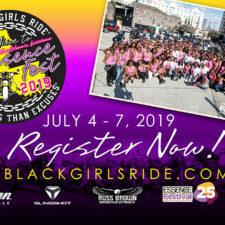 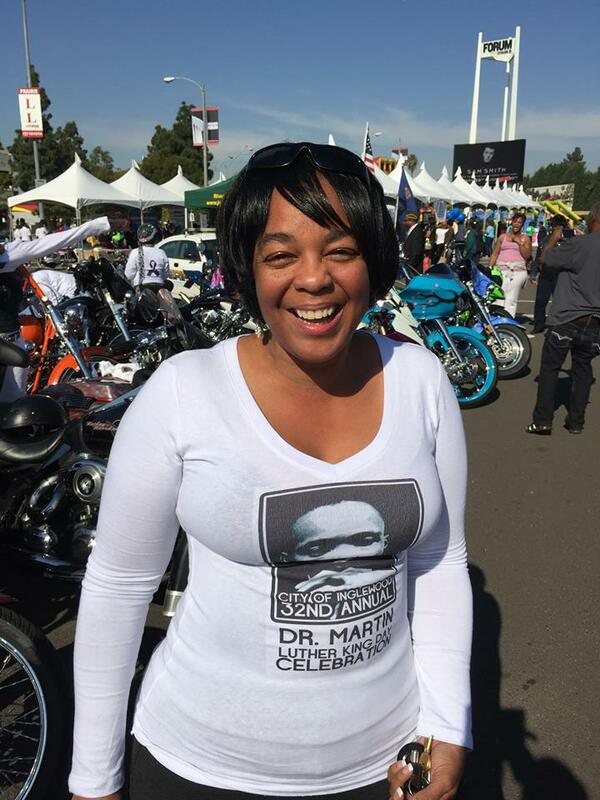 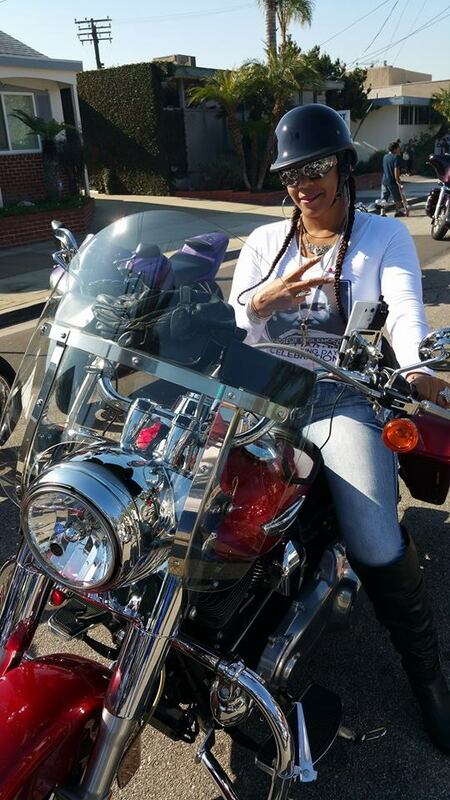 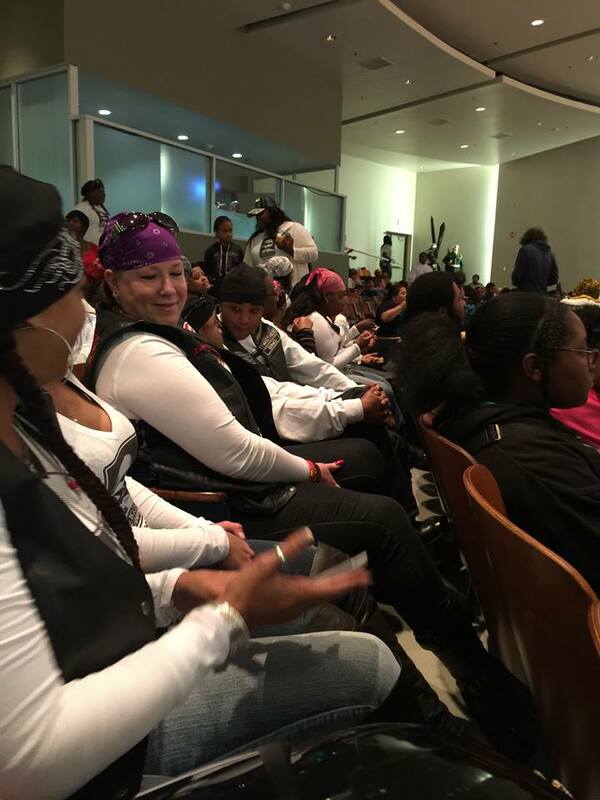 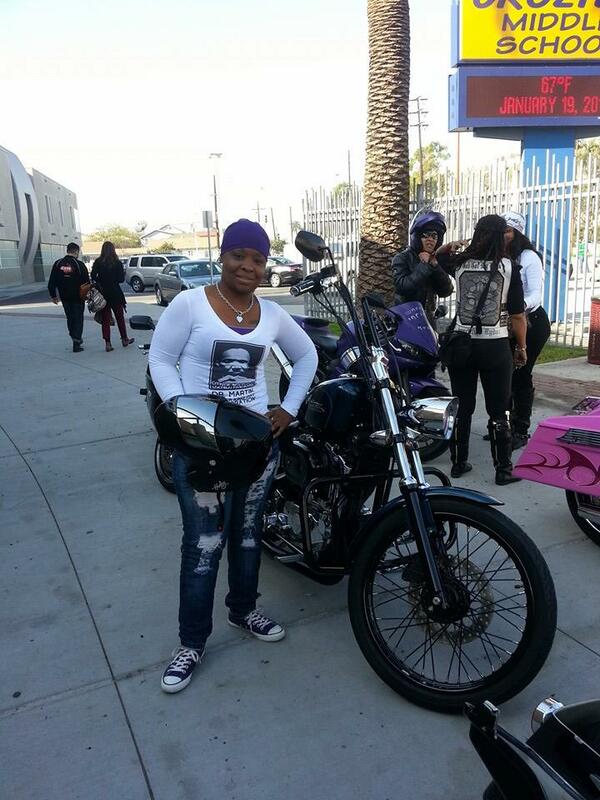 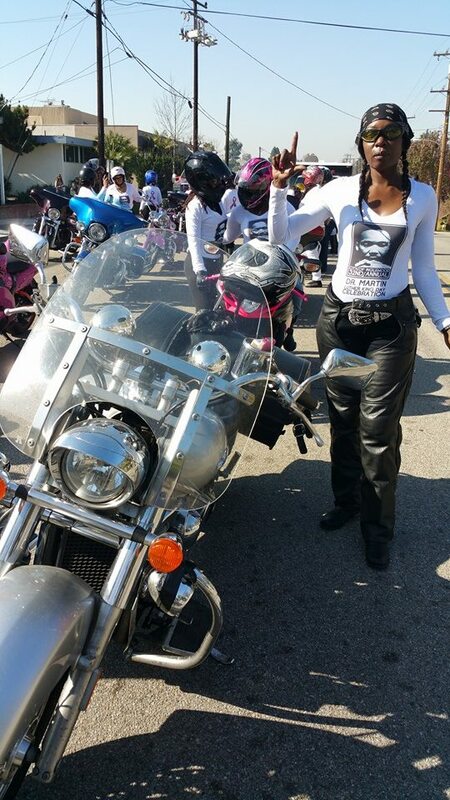 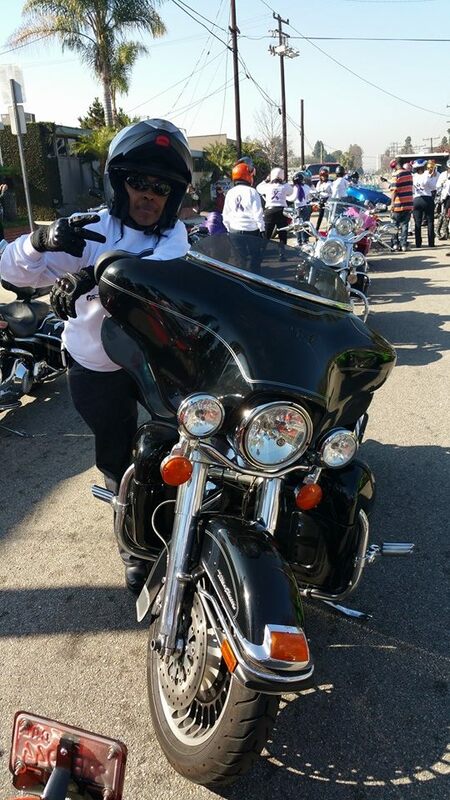 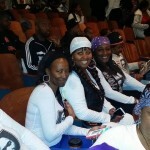 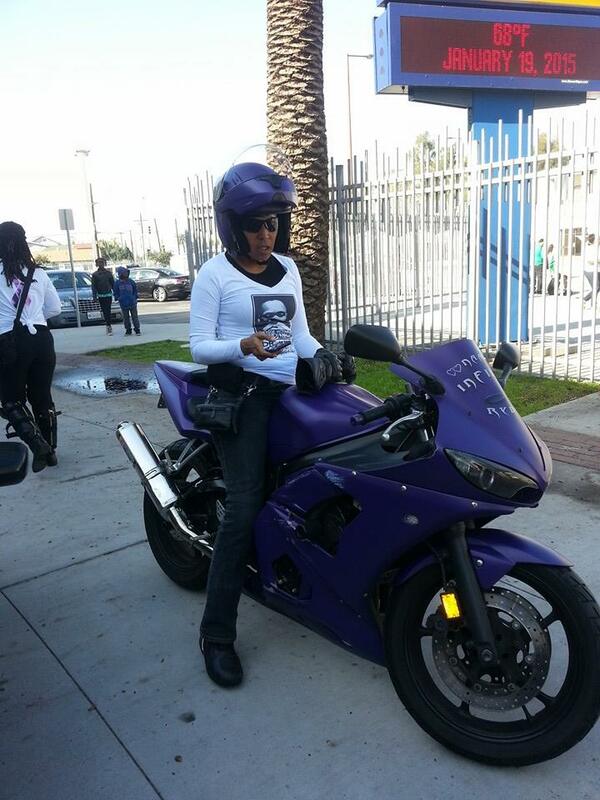 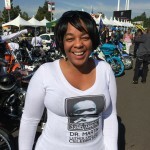 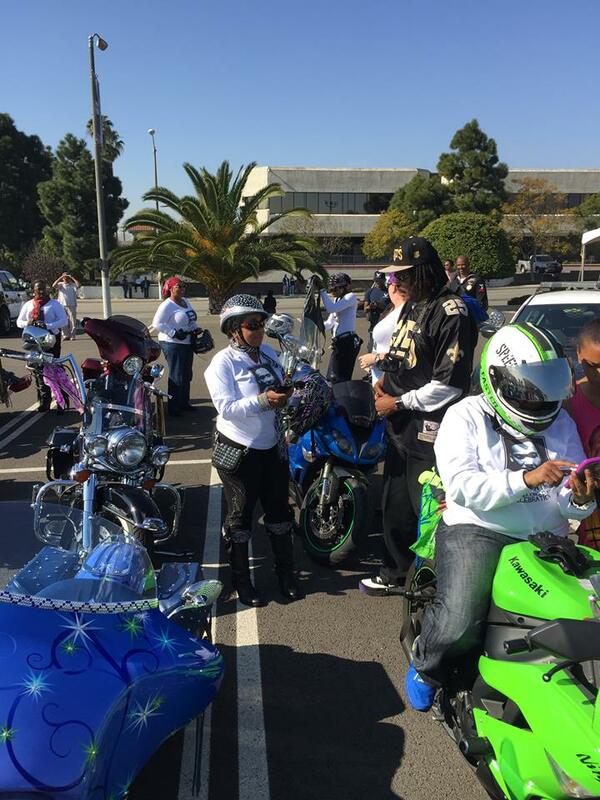 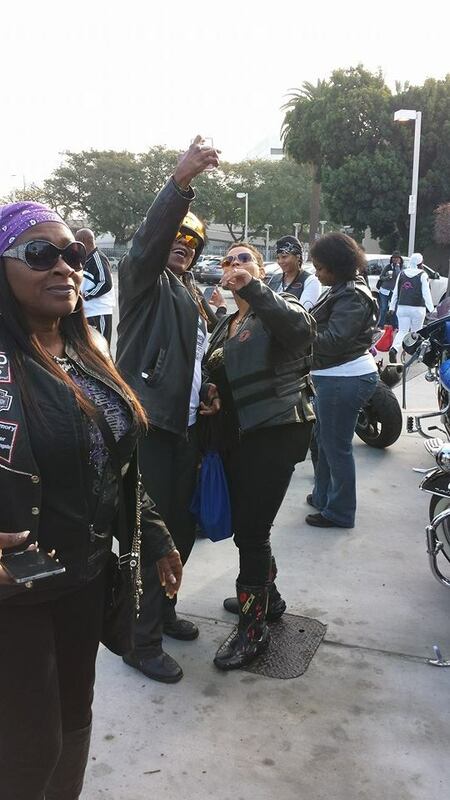 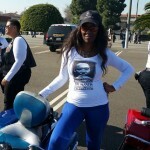 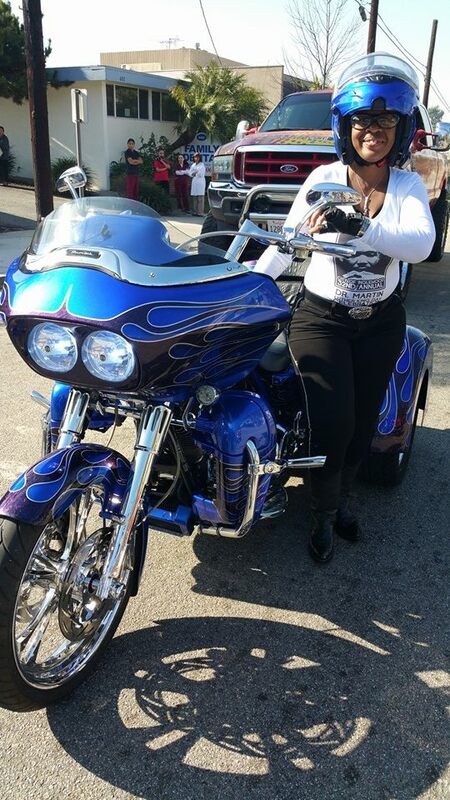 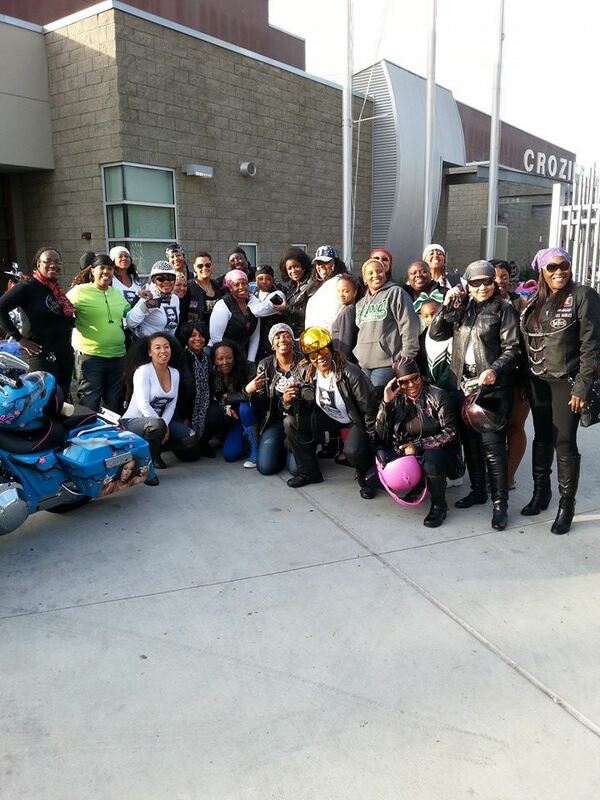 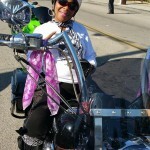 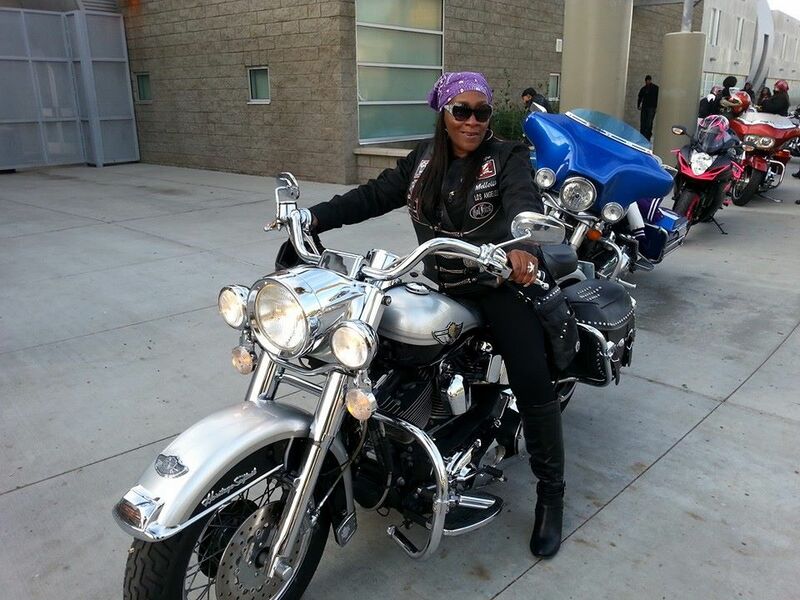 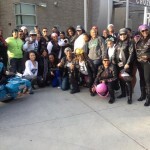 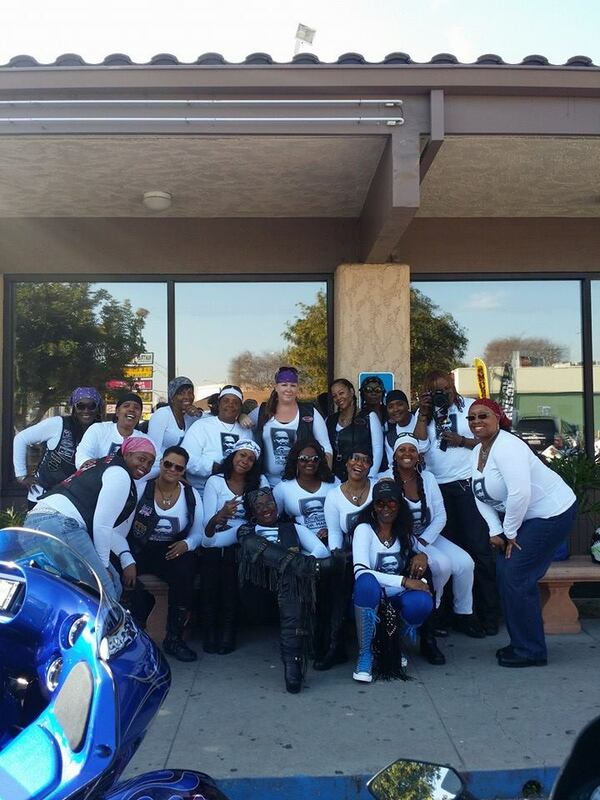 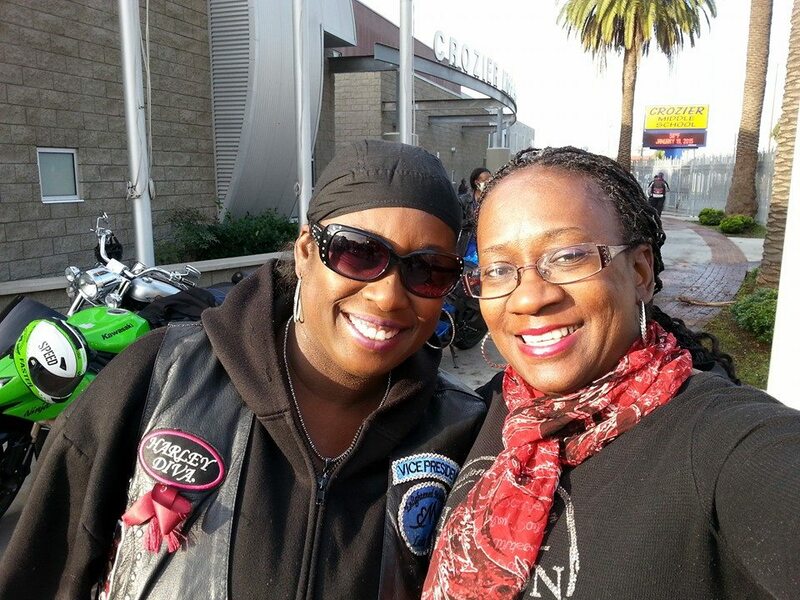 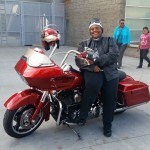 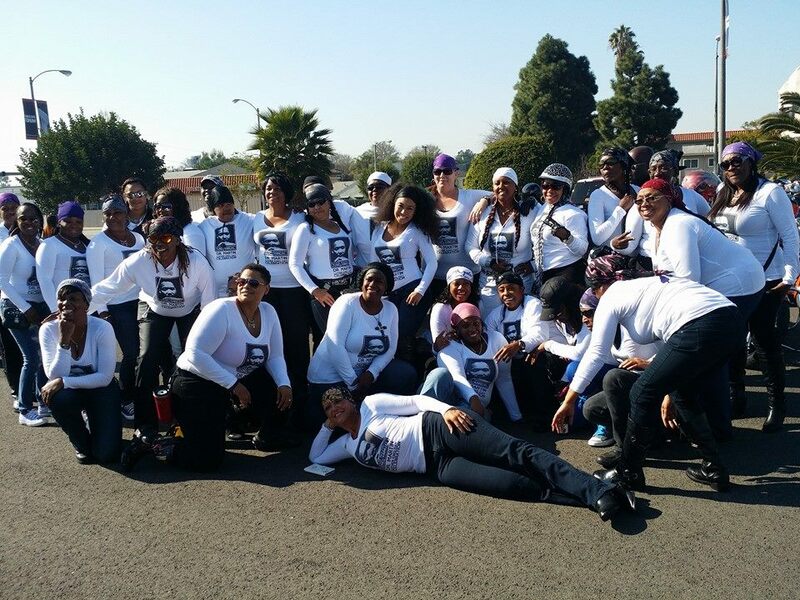 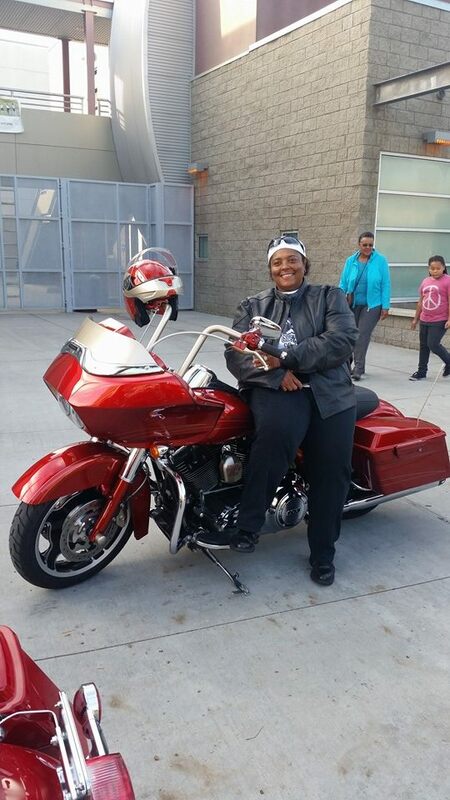 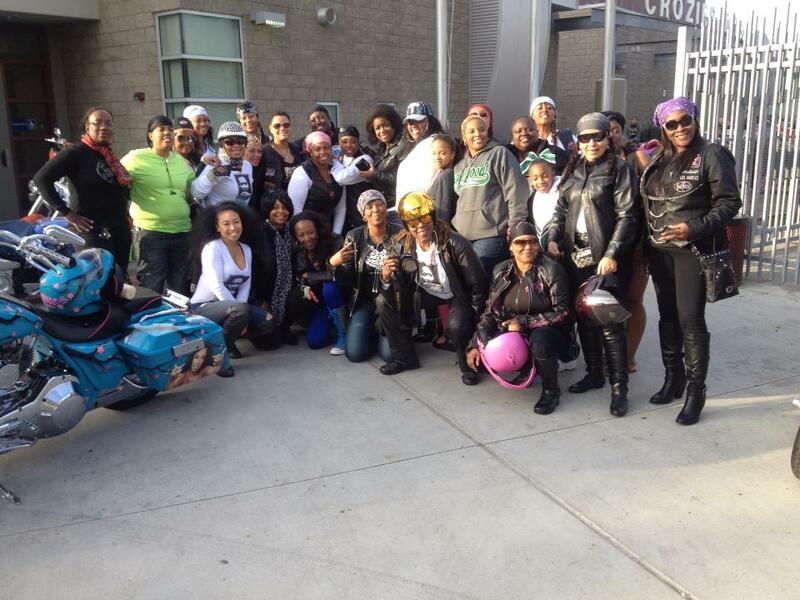 Inglewood’s 35th Annual MLK Day Parade Ride 2018 ‹ Black Girls Ride Magazine | Motorcycles, Accessories, Biker Fashion and Events for Women Who Ride! 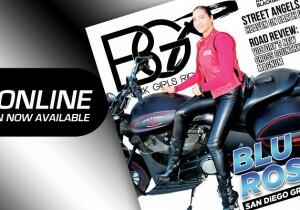 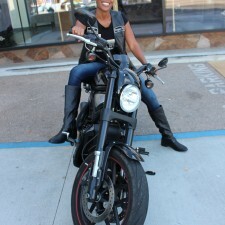 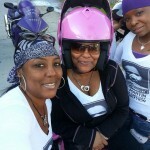 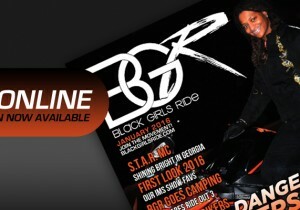 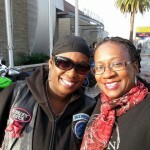 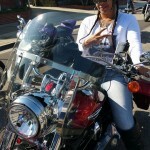 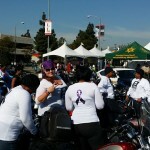 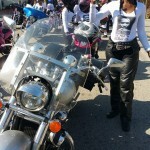 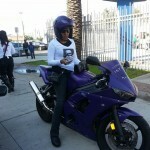 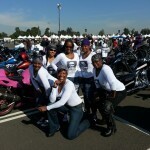 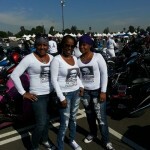 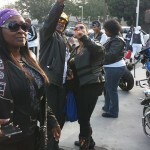 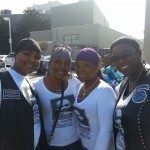 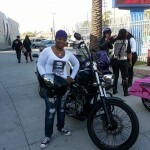 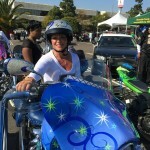 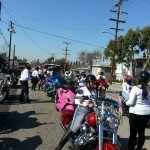 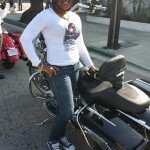 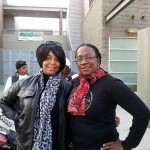 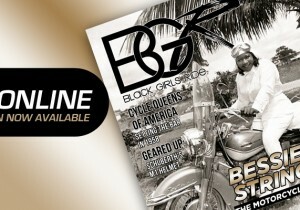 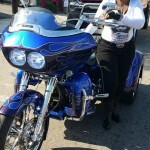 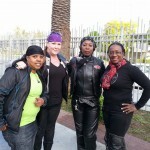 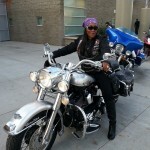 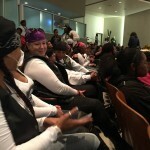 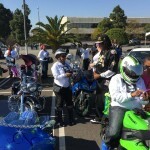 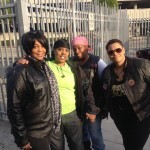 L8D Ryder Gear (l8drydergear.com) and Black Girls Ride Magazine invite you to ride in the 35th Annual Inglewood Martin Luther King Day March, hosted by KJLH on Monday, January 15! 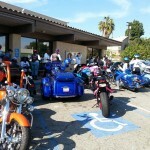 Meet spot: 321 N. Eucalyptus Ave. (Faithful Central Church), 8 AM Sharp. 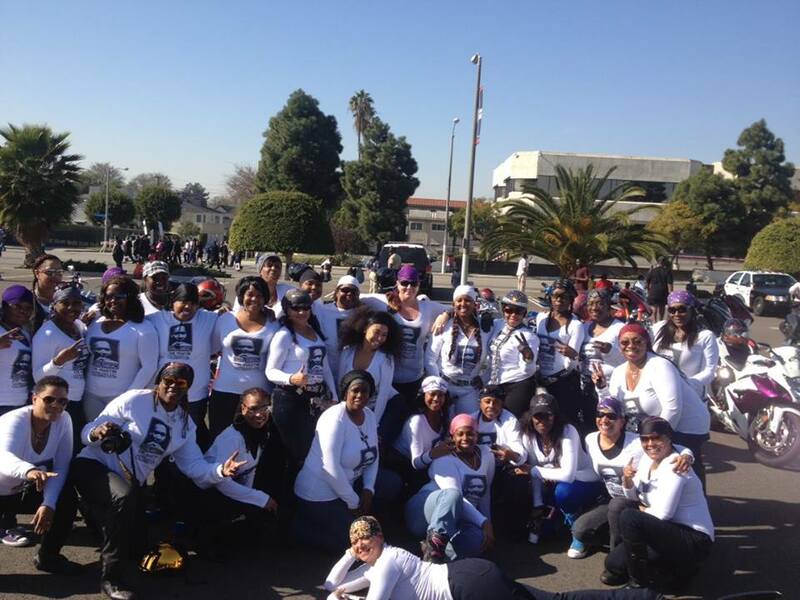 The city of Inglewood has come a long way… it’s my hometown. 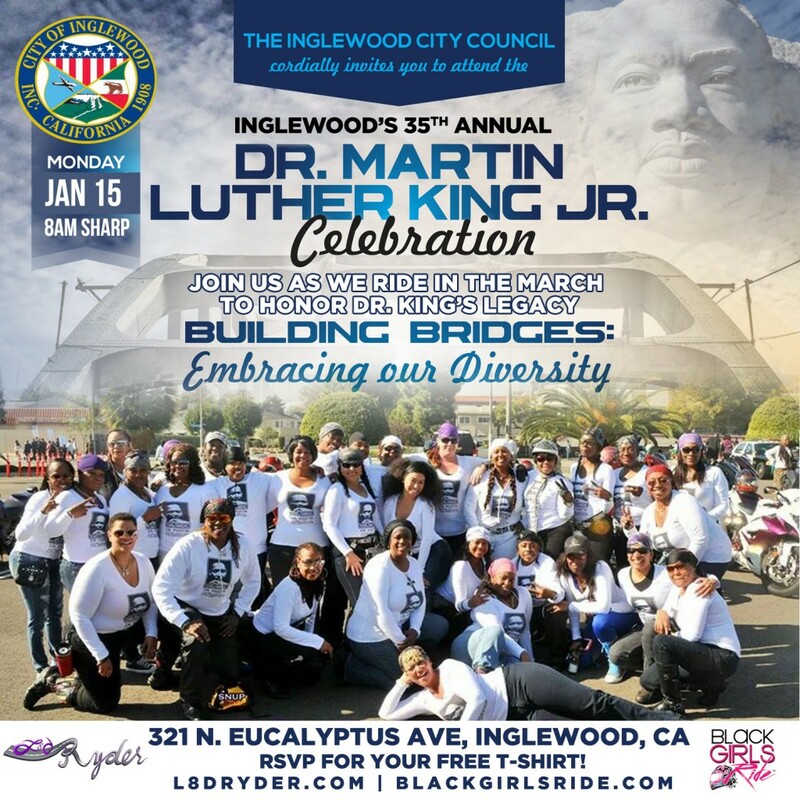 I remember my dad telling me stories about Inglewood before it was *ahem* “inclusive”. 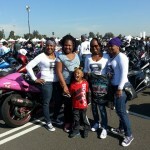 Since then, it has become an All American City, home to NBA & WNBA Champions, new NFL Teams and more. 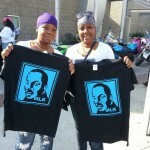 I’m proud of what the city has become. 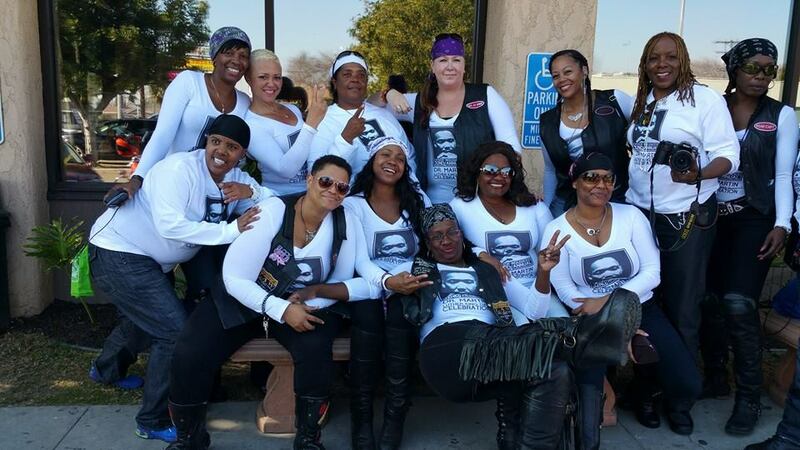 This marks our 5th year of leading the parade with a police escorted ride through the city Inglewood, to the Fabulous Forum for a Free Concert, courtesy of music legend, Stevie Wonder and KJLH Radio! 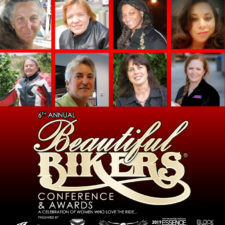 The city is always excited to see female riders on bikes, leading the way! 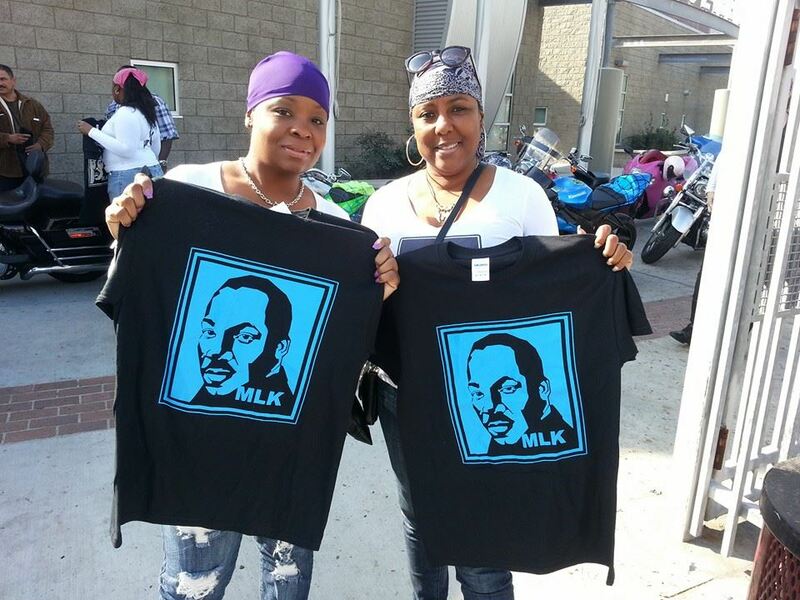 The first 30 riders to RSVP will receive a free Dr. King T-shirt. 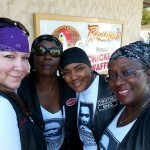 We’ll meet at 8am for check-in, photos and a breakfast. 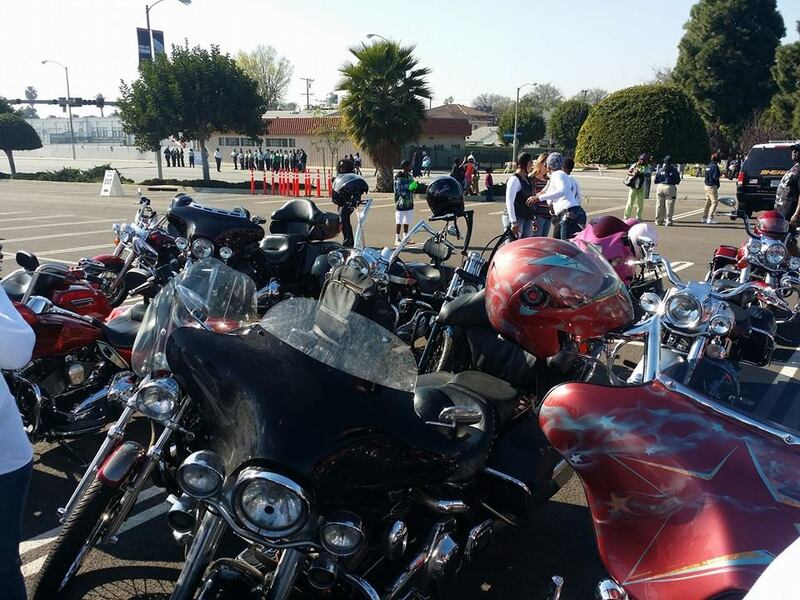 The parade ride will begin at 11am. 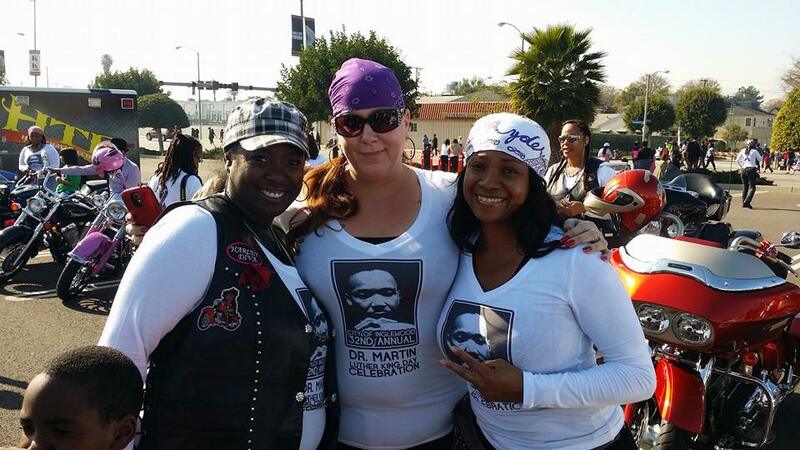 Join us as we honor the Legacy of Dr. King and the freedoms he fought for. 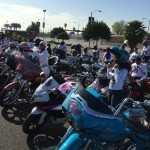 The first 30 riders to RSVP will receive a Free T-shirt. 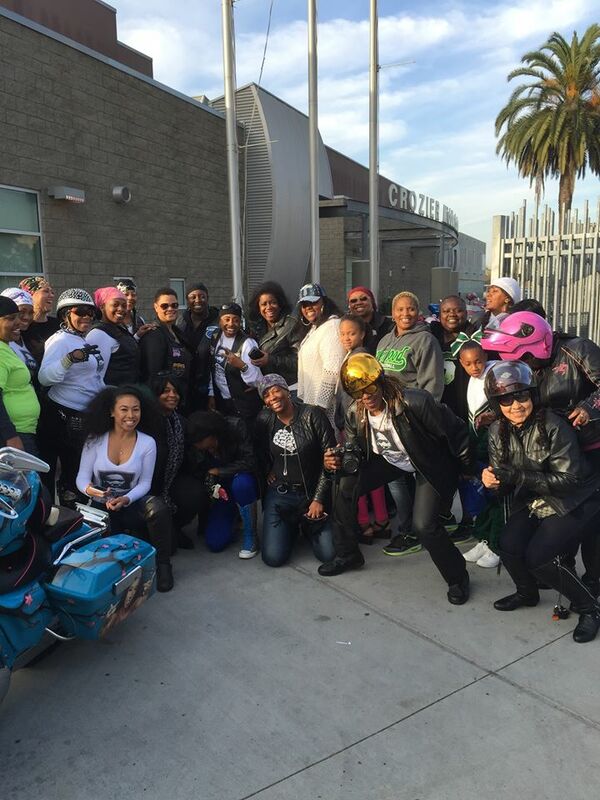 ALL RIDERS WELCOME to celebrate the Legacy of Dr. Martin Luther King! 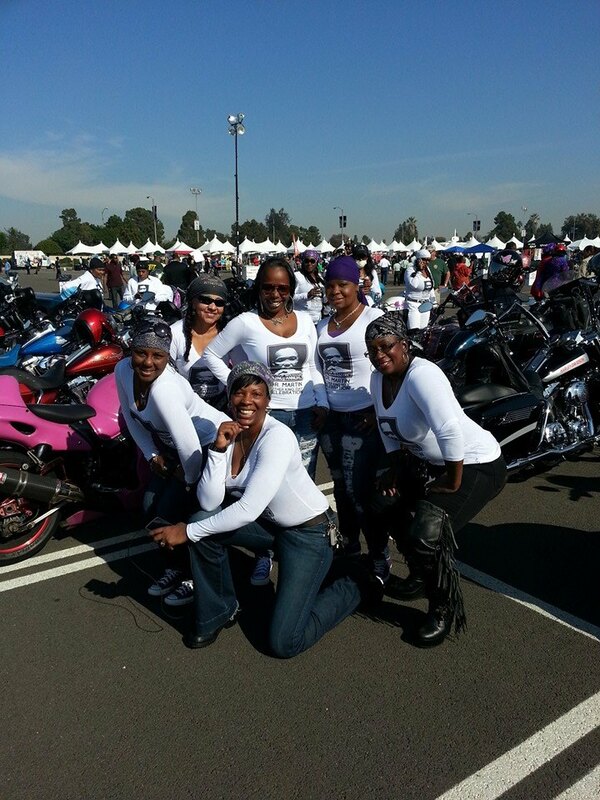 To the ladies in this picture… do you remember the feeling of all riding together, over 40 deep, leading the Inglewood Parade? 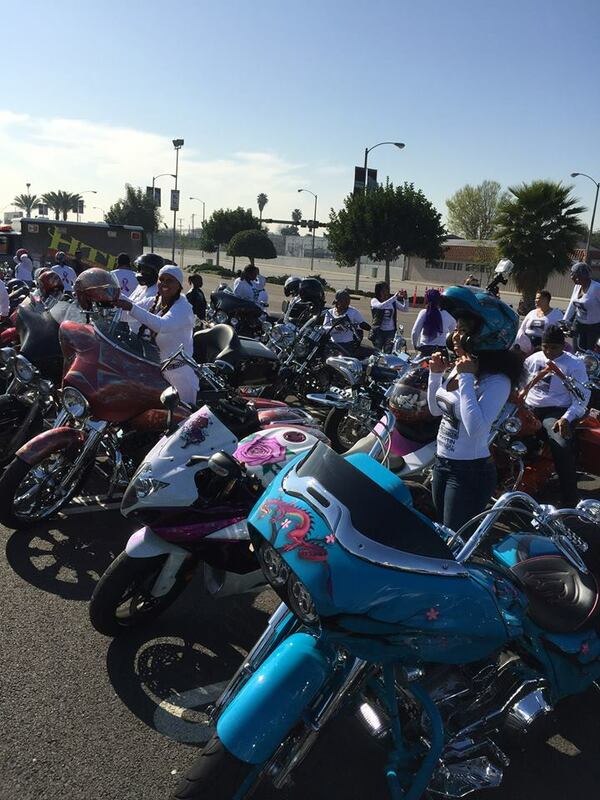 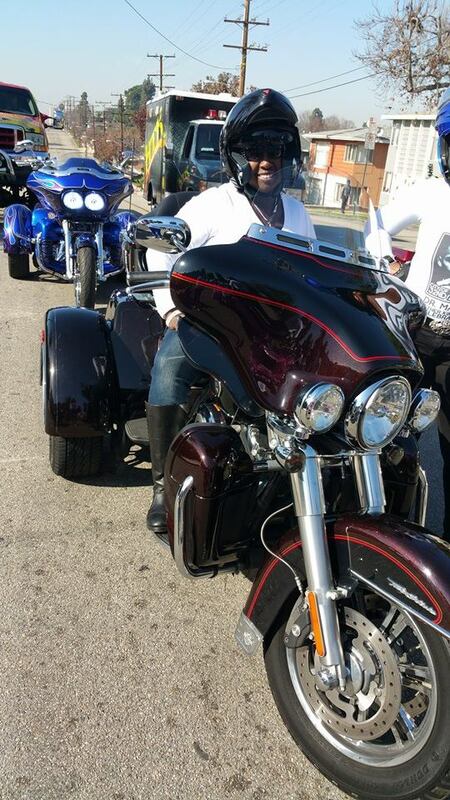 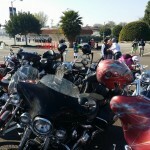 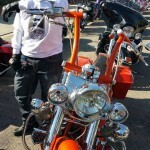 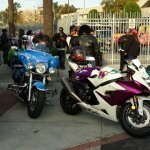 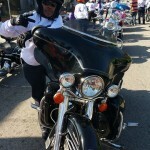 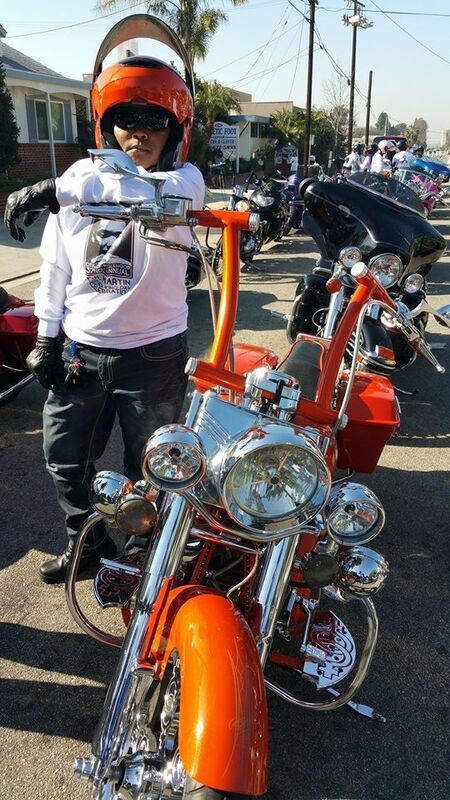 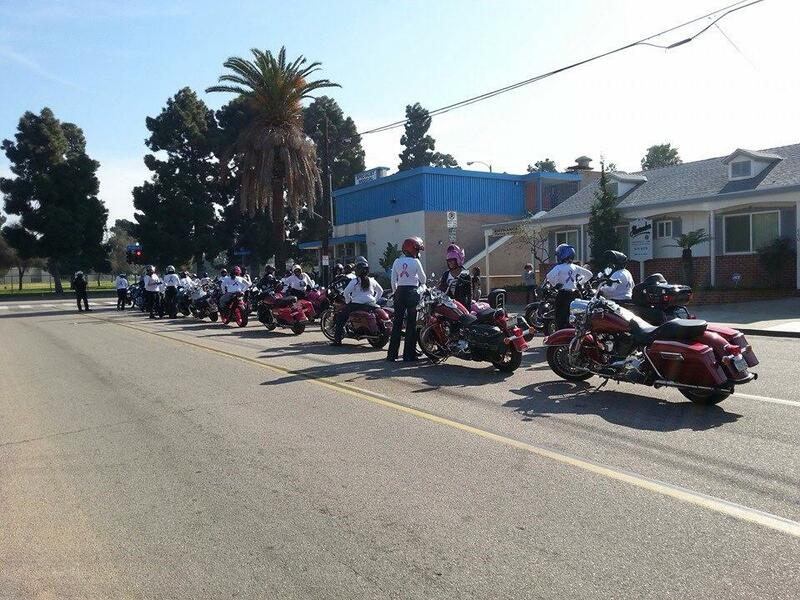 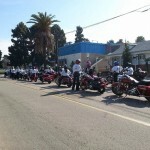 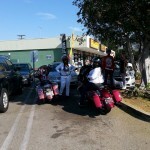 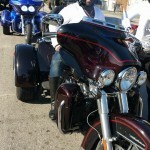 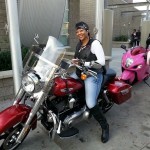 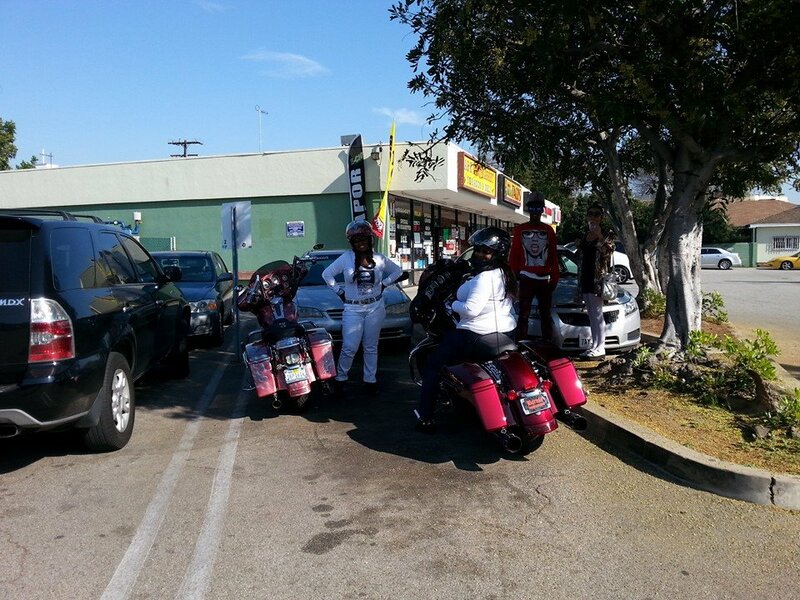 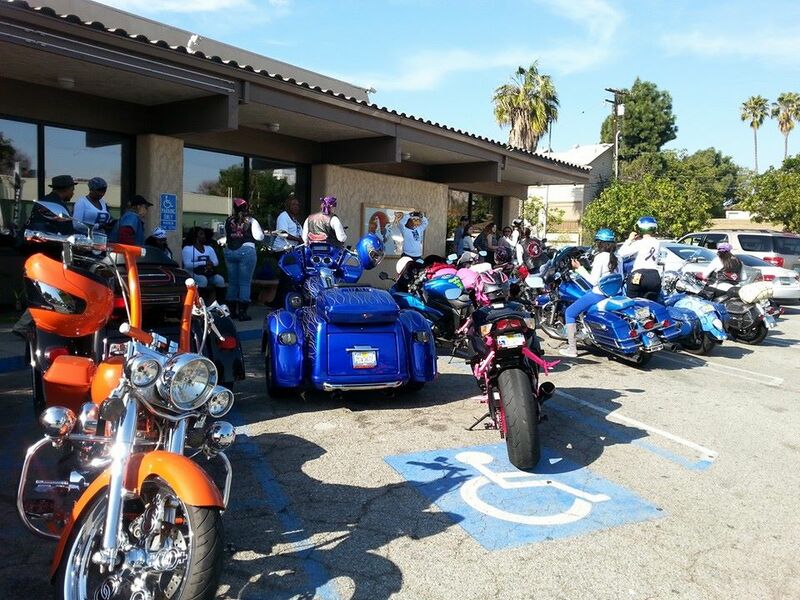 All types of bikes and riders, riding together… it was a beautiful sight! 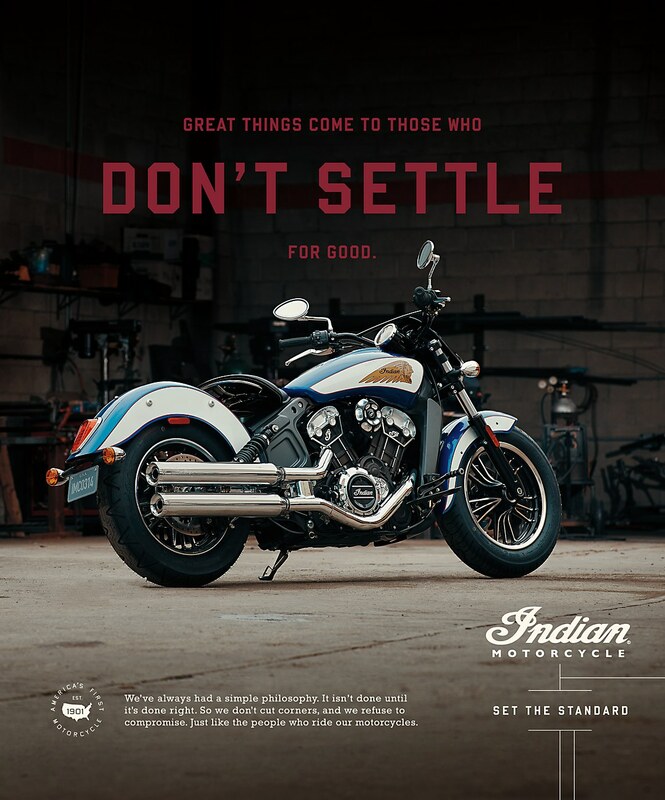 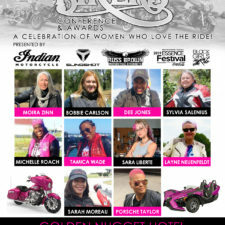 Do you remember the look of the little girls that waved at us on the street, as they realized there were WOMEN riding, pointing at our bikes, wishing they could come too? 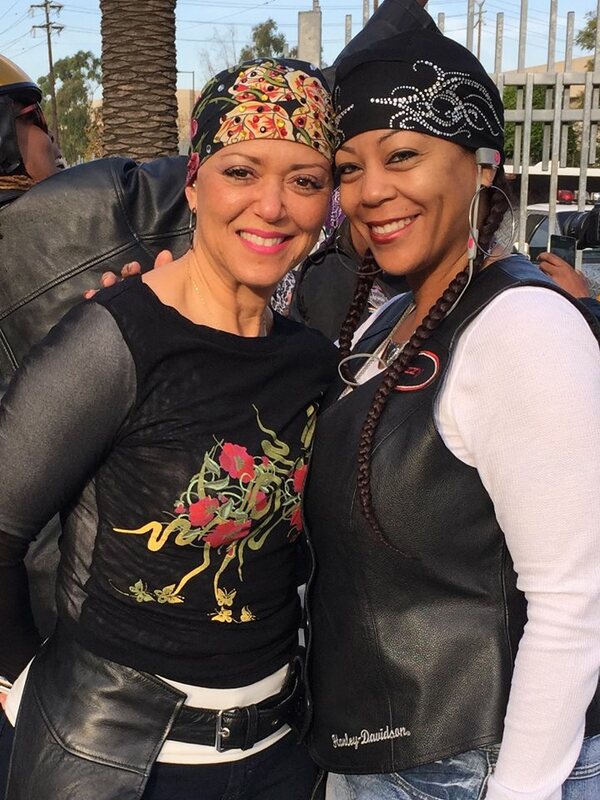 Do you remember the feeling of sisterhood when we met up, feeling like you were a part of something greater than yourself? 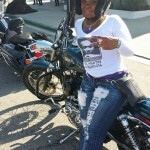 It’s been a minute since we’ve ridden together. 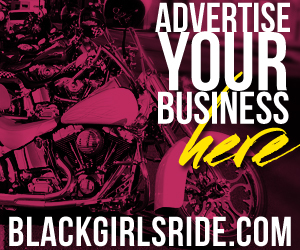 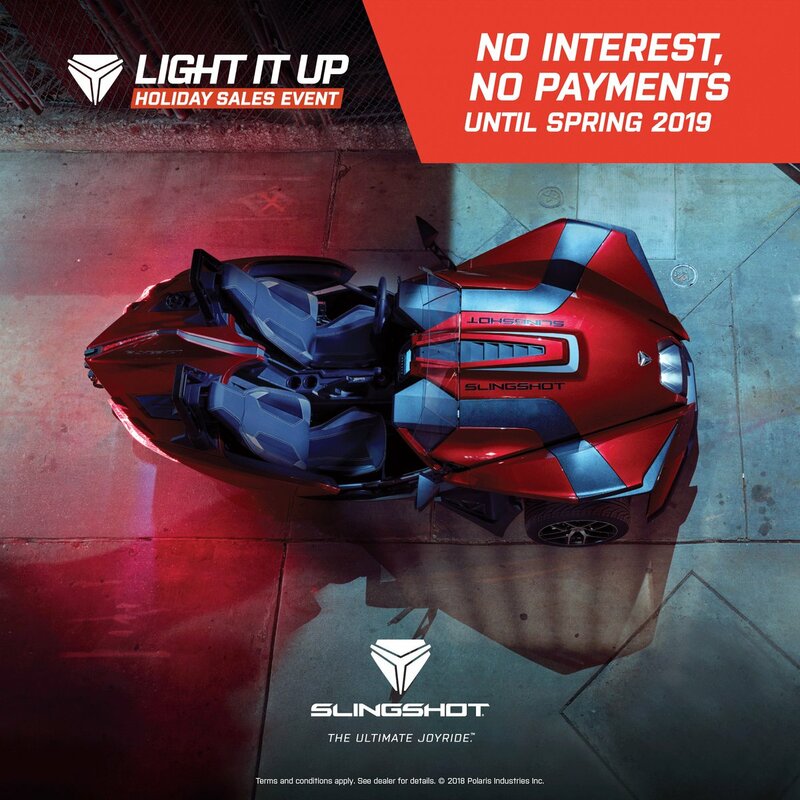 If you’re available, we would love to have you represent! 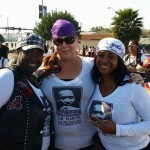 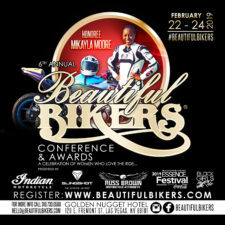 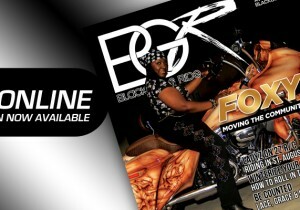 We hope to see ALL RIDERS, Women and Men, independents, MCs, New Riders… Roll for the memory of Dr. King!